Harry N. Abrams, 9781419728952, 400pp. 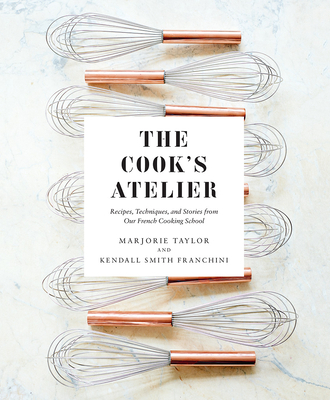 Marjorie Taylor and Kendall Smith Franchini are the mother-and-daughter duo behind The Cook’s Atelier, a French cooking school, culinary boutique, and wine shop in Beaune, France, which has been featured in many publications, including Travel & Leisure, Fodor’s, Food & Wine, Condé Nast Traveler, and more. "A welcoming 400-page beauty filled with evocative photographs and approachable recipes, it’s a volume you’ll revisit time and again." "This 400-page cookbook isn't just straight inspiration: It's a thorough reference to their Burgundy larder, with guidance on cooking essentials, seasonal menus composed of more than 100 recipes, kitchen rituals, and techniques they insist any cook can master." "In this, their first cookbook, they’ve brought their collective teaching experience to the page, guiding the reader through classic French recipes like plum tarte tatin, watermelon and vineyard peach salad, and baby leek galettes with goat cheese and wild garlic." "The Cook’s Atelier shares the classic techniques they teach: It's French cooking made easy, interspersed with a glimpse into life in regional France."